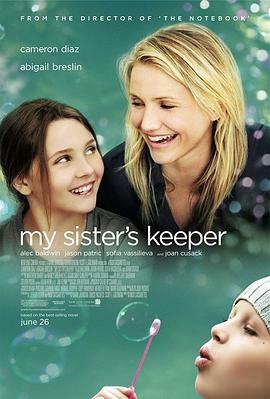 Sister’s Keeper is an emotional but sad, even desperate movie, which is ended with a unexpected ending, leaving the audience with a question worth pondering. Based on the love and family, this movie discusses that in the face of incurable diseases, the patient’s family should grasp any possible opportunities and methods to delay the patient’s life, or give in to the destiny, saying goodbye to the patient without giving over-treating. The elder sister, Kate, had leukemia since childhood. The reason why the parents gave birth to Anna is to obtain blood and cells from Anna to save Kate’s life. However, the grown-up Kate doesn’t want to live her life in this way, hurting her little sister’s health. Therefore, Kate asks Anna to refuse to transplant kidney and accuses their mother of hurting Anna’s health by using Anna’s body. Love and death are not enemies, because death doesn’t mean the love is gone. Maybe love is to let him go when the time is appropriate, releasing everyone from the pain of disease. May the deceased rest in peace and the family live strong.